How much technique do you need to be a world-class player? To play convincing bebop, for example, with its signature twists, turns, and arpeggiated ornaments, you’d surely need the ability to make any string change at any moment, at any speed, preferably with alternate picking. But what if the best jazz players don’t really play that way? What if, like the rest of us, they too must contend with the things their techniques both do and don’t do? And what if the difference between their workarounds and ours is that they don’t think of them as workarounds? 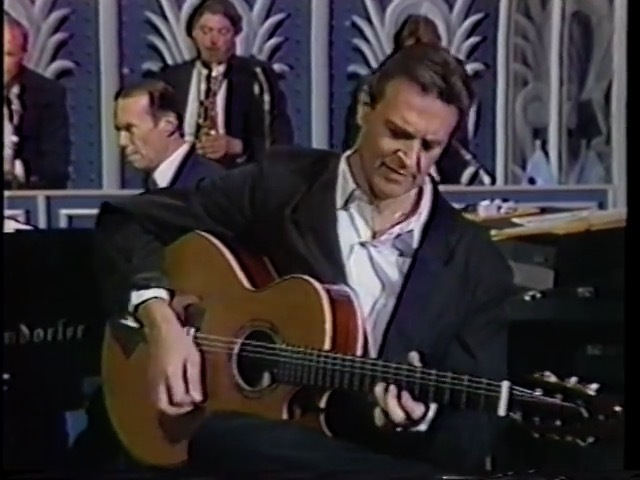 For a great example of creative workarounds in action, look no further than one of the most revered picking techniques in guitar: John McLaughlin. John has spent decades instinctively building a vocabulary that maps specifically to the downstroke-escape picking motion he uses. And rather than curtailing his musical creativity, this fascinating and largely subconscious process has instead empowered it, resulting in a vocabulary all his own. The orientation we’re using in this infographic mirrors the way we film players during interviews. In this landscape orientation, the “escape zone” is the sky, or the upper half of the image. To move to a new string without hitting any of the others, this is where your pick needs to be. When you use a single-escape picking motion, you’re essentially tracing a diagonal path as you play. Like a seesaw, one end of that diagonal motion remains buried in between the strings. That’s the trapped end of the motion. 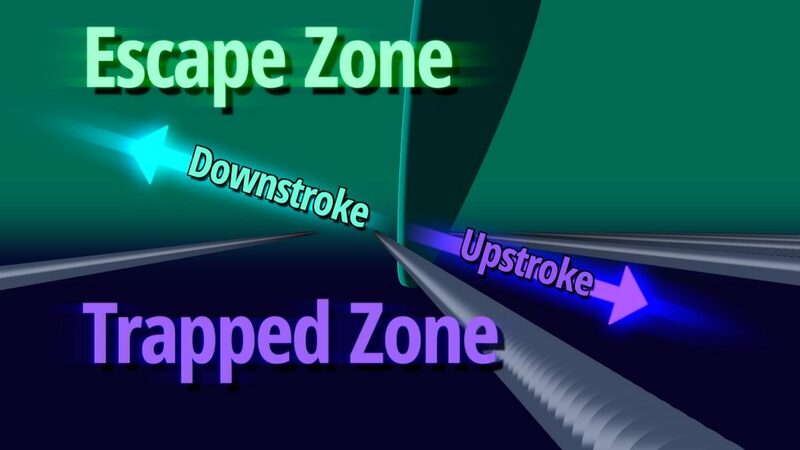 The other end of the motion, the escape stroke, aims above the strings, up into the escape zone. In other words, the reason single-escape motions can’t “play anything” is because they only escape half the time. If you’re downstroke-escape player like John, string changes don’t even really work unless the pick is in the escape zone, and that only happens on downstrokes. In this two-bar section, nearly every single high-speed string change occurs when the final note on the string is a downstroke. And that’s not unusual. In the first 33 measures of the solo — the entire verse, before the bridge kicks in — there are 49 string changes that occur during fast single-note playing. Only 4 of them are upstroke string changes. The remaining 45, representing a staggering 92% of the fast string changes, are downstroke escapes. If John’s note choices were unrelated to the mechanics of switching strings, we might expect the final note on any given string he plays to vary randomly between downstrokes and upstrokes. But that’s not what we’re seeing. The sheer preponderance of downstroke string changes is no accident, but instead the result of a concerted process of curation. The sequence begins with a downstroke escape that moves away from from the instrument body, and follows up with five more pickstrokes, each of which alternates between trapped and escape strokes. The clip freezes on the seventh note, an escape stroke, with the pick poised away from the instrument body, in the air adjacent to the strings. Amazing. Just to be clear, the link we’ve noticed between John’s picking motion and his fretboard choices is not optional, and not open to personal interpretation. If you use the motion he uses, you must arrange lines this way or they won’t be playable at these speeds. If you change the motion, then you either need to flip the order of downstrokes and upstrokes, or rearrange the fretboard shapes, to make the string changes work out. When I was a teenager, and first learning guitar, this link between picking mechanics and fretboard arrangement was never discussed. As far as I am aware, it was simply not known. (Stumbling across these links is, of course, how Cracking the Code got started.) Moreover, the idea that one of the most purely capable picking technicians of all time might be in any way beholden to mechanical constraints on his creativity would have been positively heretical in the ’80s. But here we are, seeing it and transcribing it. At this point you might justifiably be asking yourself if this sophisticated and statistically highly improbable method of organizing his lines is something John performs consciously. After all, it’s something that, to my knowledge, he has never spoken about. Given how integral it is to his style of playing, why wouldn’t he mention it? In light of what we know about the mechanical necessity of downstroke escape string changes in John’s playing style, what are we to make of this? He’s either part of a vast illuminati-style conspiracy of jazz masters, working together to conceal the mysteries of picking technique from the rest of us… or he’s simply not aware he’s doing these things. I’m kidding about the conspiracy theory, but not about the supreme intuition. More than a decade and dozens of interviews later, one of the things we’ve learned is that players at this level are indeed being genuine when they describe not thinking much about the mechanics of their picking techniques. Most of them learn technique by feel, without explicit awareness of the motions they’re making. If that sounds like a tall order, it is. The ability to teach yourself world-class guitar technique is impressive. The ability to teach yourself a technique you don’t even know exists, and then to organize an entire musical vocabulary around that technique, while being largely unaware of doing so, is positively super-powered. That’s what separates the greats from the rest of us. 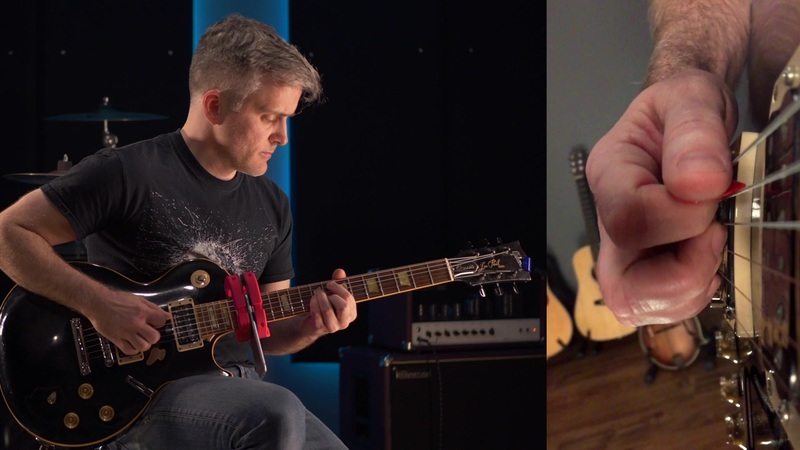 While it’s unrealistic to expect every guitar player to reinvent the wheel of picking technique on their own, we no longer need to do that. It may have taken John years to gradually hone a working vocabulary using his sixth sense for mechanical efficiency. But because we’re now explicitly aware of the technique he’s using, and how to organize our fretboard layout to support that, we can turbocharge the process by actually composing a few lines with his mechanics right now. The idea isn’t to sound lke John, and to my mind this phrase, with its use of chromaticism, really doesn’t. One look at the short “Cherokee” tablature excerpt above makes clear several of John’s more signature stylistic elements, like two-note-per-string motifs, which we’re not trying to copy here. Instead, the idea is to take his relatively simple and straightforward mechanics and implement a musical style — in this case, an old-school swing type vibe — that on the surface you might think would require more technique to accomplish. To that end, without leaving a comfortable four-fret position, we’ve created a dominant-flavored line that descends by way of chromaticism, and includes a tasty enclosure figure in the middle that approaches the third of the chord from underneath. The line ends on the flat 7, leaving the fingers in place to outline a comfortable dominant 13 grip. There’s a lot going on in this short phrase melodically, but the mechanics are blessedly simple. This is pure alternate picking, and all string changes occur during downstroke escapes, so there’s no need to do anything but move your wrist back and forth. If you’ve seen or read any of our previous work on pickslanting, then you may have already noticed that these lines are played to varying degrees with a slight upward pickslant. That is indeed what John himself also does. But… try to not worry about that right now. Instead, focus on the path of the picking motion as it travels from trapped to escaped and back again. Creating that linear, slightly tilted pathway using just the motion of your wrist, with no forearm, elbow, or fingers, is your first order of business. If you get stuck, refer to my forearm orientation, anchor points, and pick grip in the accompanying video clips for reference, and try to duplicate them as closely as possible. If you’re still stuck, you’re might consider checking out Cracking the Code’s Pickslanting Primer for more detailed instructions on doing precisely this. Of course now we have even more variables to engineer. In addition to downstroke-powered alternate picking string changes, we’ve included upstroke sweeping. That’s because, once again, in the downstroke escape picking style, the upstroke is the trapped pickstroke. In other words, it’s the pickstroke that’s still stuck in between two adjacent strings. In combination with legato notes, this simple addition to our mechanical toolbox now affords us alternate picking in both directions and sweeping in the upstroke direction. This gives us quite a degree of flexibility. We can not only play a wide variety of fretboard shapes with no loss of motion fluidity, even at blistering speeds, but we can do so with a wide range of articulations, from accented pickstrokes to “barely there” slides and pulloffs. Combine these possibilities with the kind of lifelong experimentation done by highly creative players like John, and it’s like filling up a sonic laboratory. A known set of equipment goes in, but what comes out reflects the genius of the inventor. There is no doubt that picking technique exerts a profound influence on the kinds of lines great players choose to play. There are rules, yes. But those rules don’t feel restrictive thanks to the organic, hands-on way that great players feel their way through them. 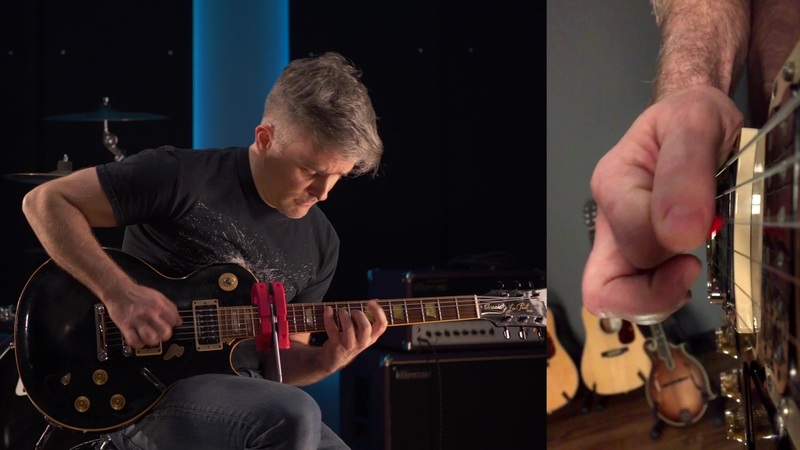 From our interviews with Mike Stern, Frank Gambale, Jimmy Bruno, Albert Lee, Oz Noy, and many others, we know that amazing improvisers don’t consciously sense any limitation on their musical expression imposed by their picking mechanics. The same way that native speakers of a language don’t feel constrained by the rules of grammar, the feeling that you can say anything on your instrument just means that you’re so fluent in its mechanics that you are no longer conscious of them. So no, you don’t need all the picking techniques in the world, or even most of them, to build a full vocabulary. At minimum, you really just need one motion. And like the downstroke escape pickstroke, that motion can even be one of the simplest motions you can make. That simplicity, with its seemingly restrictive rules about when you can and cannot move to a new string, may at first seem like a creative impediment. But as John’s relentlessly inventive playing shows us, creativity doesn’t come from, or stop with, your mechanics — it comes from you. While working on some jazz-flavored lines for the Pickslanting Primer update, we though this would be a good topic for a blog post. Do you “need” fancy picking techniques to play complex music? Not at all. And who better to exemplify this than John McLaughlin, one of the most formidable technicians to ever wield a plectrum. With a simple single-escape motion and maybe a little sweeping and legato, you can craft some killer stuff in almost any style. This is why we always recommend working on vocabulary wiht the technique you have right now, rather than chasing the technique you may think you need, but don’t yet have. This is Robben Ford discussing exactly this topic. I love John’s playing but he doesn’t really play bebop lines. I think studying Jimmy Raney (who uses a legato technique) , tal farlow , chuck wayne (the first jazz guy to use economy or sweep picking), Billy bean, Joe pass , pat martino or George Benson would get you closer to sounding like a bebop guitarist . John plays more patterns whereas a bebop guitarist is more linear and has lines that switch directions more…more varied peaks and valleys within the line. I bashed away at crosspicking for 5 months, but actually the John McLaughlin motion is the only one I can do right now. Now I’m just practicing with that and I can now play much smoother, quicker lines arranged for this motion. Also I’m having a lot more fun learning, because I can learn these lines quicker. I have left the crosspicking stuff for a while, hopefully developing a 2-way escaped motion will come eventually and I can come back to the bluegrass tunes later, but at the moment I enjoy learning 3nps lines arranged for DSX and also pentatonic stuff too, as well as just using a bit of hybrid picking or legato to change after upstrokes. Thanks Troy for this great article and also the liberating advice to just work with what you can do now! I can now play much smoother, quicker lines arranged for this motion. Also I’m having a lot more fun learning, because I can learn these lines quicker. But now I’ve started telling my students “when you get it, you’ll practice more” and then trying to engineer the epiphany for them. Progress is its own reward. Next PostDo You Need To Practice 8 Hours A Day?